The Amerian Classic Gold (TM). This whistle is handcrafted from solid brass and overlaid in rich 24K gold. The solid walnut display case and velvet lining enhances the whistle's lustrous finish. ONLY THE BEST! Give your favorite coach or official the same whistle presented to the Super Bowl referees. Makes a great gift for coaches, officials, police officers, gym teachers, and anyone else who has been known to blow a whistle. 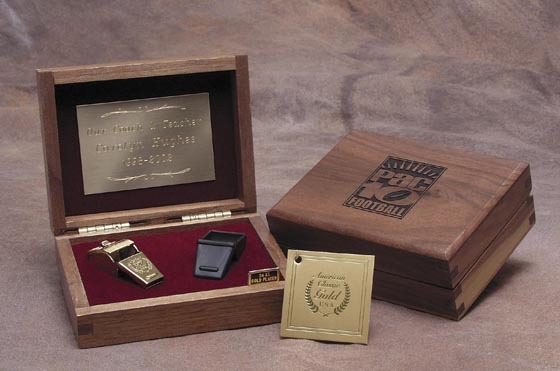 To make this a more personal gift, engrave name or initials on the whistle, add an engraved nameplate to the inside of the lid, or have the box lid engraved. The recipient can display the whistle in its case or enjoy using it with the enclosed Safe-T-Tip (TM) cover, which will protect the lustrous finish for years and years. The whistle itself may be engraved with up to 5 letters at an additional charge. Click on Personalized. Also, the box lid can be engraved with a person's name, a school name, a business name, etc. for an additional charge. And....your logo can be die-struck on the whistles. it requires a minimum order of 20 dozen. Please email us. Our less expensive American Spirit line is also available with a gold, silver, or bronze finished whistle.